Chlamydia trachomatis is a prevalent sexually transmitted disease and the leading cause of infectious blindness in developing nations. It was not known if C. trachomatis-infection influenced metabolism of lipoprotein-derived phospholipids. Nor was it known if C. trachomatis-infection altered phosphatidylcholine (PC) secretion from hepatocytes. In the current study, low density lipoprotein (LDL)-derived [methyl-3H]PC metabolism was examined in L929 cells infected with C. trachomatis to determine if PC derived from LDL could serve as a potential source of PC trafficked to C. trachomatis. In addition, release of endogenously synthesized [methyl-3H]PC into the medium was examined in rat liver hepatocytes infected with C. trachomatis to determine if infection altered PC secretion. L929 cells 20 h post infection exhibited a 39% (p < 0.05) reduction in radioactivity in PC but total radioactivity incorporation was unaltered compared to controls. Lysophosphatidyl [methyl-3H]choline (LPC) and aqueous [methyl-3H]choline metabolites were elevated 3.6-fold (p < 0.05) and 16.5-fold (p < 0.05), respectively, in C. trachomatis-infected cells and this was due to a 51% increase (p < 0.05) in calcium-dependent phospholipase A2 activity. Hepatocytes 22 h post infection then incubated for 16 h with [methyl-3H]choline showed elevated [methyl-3H]PC biosynthesis but [methyl-3H]PC secreted into the medium was unaltered compared to controls. In contrast, both cellular and medium lyso [methyl-3H]PC were elevated in C. trachomatis-infected cells. This study is the first to show that metabolism of LDL-derived PC is accelerated in C. trachomatis infection and to support the notion that LDL-delivered PC may potentially serve as a source of PC trafficked to Chlamydia. In addition, C. trachomatis-infection does not inhibit PC secretion from hepatocytes indicating that the pool of newly synthesized PC destined for lipoprotein secretion may differ from the pool of PC used for C. trachomatis membrane biosynthesis. Chlamydia trachomatis is an obligate intracellular eubacterial parasite which is capable of infecting a wide range of eukaroytic host cells . It is a prevalent sexually transmitted disease and is the leading cause of infectious and preventable blindness in developing nations. C. trachomatis has a complex biphasic life cycle that facilitates the organisms survival in two discontinuous habitats. The elementary body (EB) is the metabolically inactive spore-like form of the organism responsible for the initiation of infection. Once attached and internalized by a suitable host cell EBs differentiate into RBs (reticulate bodies), the metabolically active form of the organism that grows and replicates within an inclusion membrane in the cytoplasm of the host cell. Sixteen to 20 h post infection RBs are actively replicating and some begin to differentiate back into EBs. Between 48 and 72 h RB replication is completed and EB's predominate within the cell. The host cell lyses and EB's are released to begin a new infection cycle. PC is a major membrane phospholipid found in most eukaryotic cells and some prokaryotes [2, 3]. Previously, we observed that endogenous host cell derived PC was trafficked to C. trachomatis . The first key step of the process involved the deacylation of endogenous host cell PC by phospholipase A2 (PLA2) to form LPC, followed by the subsequent reacylation of LPC at the sn-2 position with a branched chain fatty acid. In a separate study, we observed that the phospholipid composition of C. trachomatis mimicked that of the eukaryotic host cell in which it was grown . Purified EBs isolated from a mutant Chinese hamster ovary cell line, with a thermolabile cytidinediphosphate-choline synthetase and hence lowered cellular PC levels, had decreased levels of PC compared to EBs isolated from cells grown at the permissive temperature. Plasma lipoproteins are soluble aggregates of lipids and proteins that deliver lipids from the liver and intestine to peripheral tissues . Very low density lipoprotein, secreted by the liver, is the principal source of endogenously derived triacylglycerols. Very low density lipoprotein is metabolized to LDL by hydrolysis of triacylglycerol and this is catalyzed by lipoprotein lipase in peripheral tissues. The circulating LDL particles contain a neutral lipid core consisting of cholesterol esters and triacylglycerol. The surface of LDL particles contain both unesterified cholesterol and phospholipid as well as the apoprotein component apoB-100. The principle phospholipid found on the surface of LDL particles is PC. This PC has two metabolic fates. It may serve as the acyl donor for the lecithin:cholesterol acyltransferase reaction in plasma to generate cholesterol esters which are transferred to high density lipoprotein particles for delivery to the liver, the reverse cholesterol pathway. A second fate of PC in LDL particles is the uptake into liver and peripheral tissues by LDL receptor-mediated endocytosis. Prior to this report it was not known if C. trachomatis-infection could influence the metabolism of exogenous lipoprotein-derived phospholipids. Nor was it known if C. trachomatis-infection affected PC secretion from hepatocytes. Hence, we examined the fate of PC derived from LDL particles in C. trachomatis-infected mouse L929 cells and if C. trachomatis-infection affected PC secretion from isolated rat liver hepatocytes. LDL particles are taken up by cells by receptor-mediated endocytosis involving the LDL receptor . To examine if metabolism of PC derived from LDL was altered by C. trachomatis infection, mouse L929 cells were infected with C. trachomatis at a multiplicity of infection of 3 to 5 CFU (infection-forming units per cell). Mock-infected cells were treated in an identical fashion to infected cells except that the organism was absent. At 22 h post infection or post mock-infection, cells were incubated for 5 h with [3H]PC-LDL and the total uptake of radioactivity in L929 cells was determined. Total uptake of radioactivity was identical between mock- and C. trachomatis-infected cells (Fig. 1A). The organic fraction from these cells was isolated and radioactivity incorporated into PC in these fractions determined. Radioactivity in PC was reduced 39% (p < 0.05) in C. trachomatis-infected cells compared with mock-infected cells (Fig. 1B). These data indicate that LDL-derived PC was actively taken up by L929 cells and that PC catabolism may be increased in C. trachomatis-infected L929 cells. Incorporation of [ methyl - 3 H]choline labelled LDL into L929 cells, PC, LPC and aqueous fraction. L929 cells were infected with C. trachomatis at a multiplicity of infection of 3 to 5 CFU. 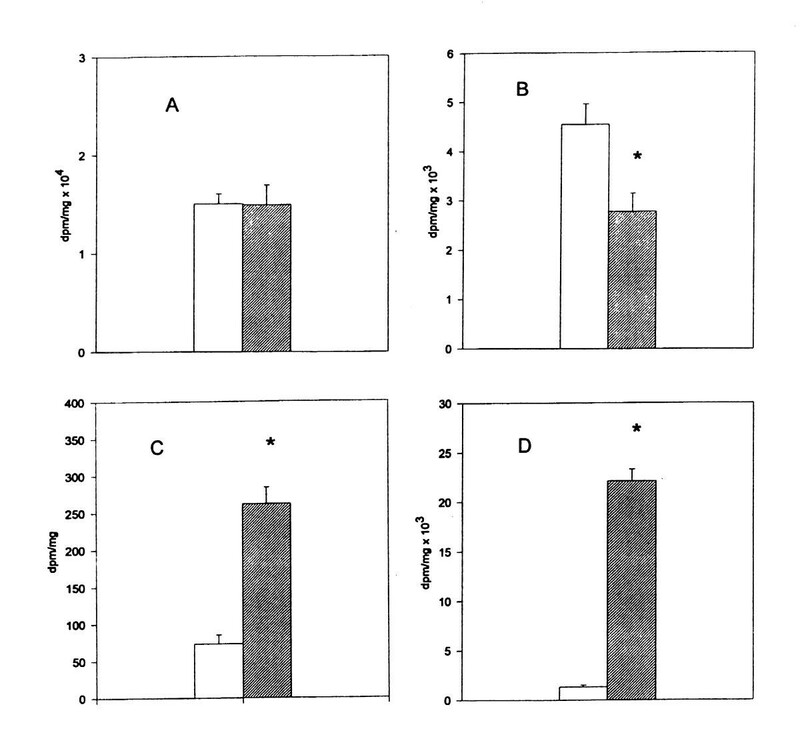 At 22 h post infection (hatched bars) or post mock-infection (open bars), cells were incubated for 5 h with [3H]PC-LDL and radioactivity incorporated into A. L929 cells; B. PC; C. LPC; and D. aqueous fraction determined. Results represent the mean ± standard deviation of three dishes. *p < 0.05. The reduction in radioactivity in PC and the absence of an alteration in total radioactivity associated with the cells in C. trachomatis-infected cells indicated that the metabolism of PC that had entered into the cell was accelerated. Thus, the incorporation of radioactivity into the immediate PC metabolite LPC was determined. Radioactivity incorporated into LPC was elevated 3.6-fold (p < 0.05) in C. trachomatis-infected cells compared with mock-infected cells (Fig. 1C). LPC is a potent membrane lytic agent and is rapidly metabolised in cells to aqueous choline-containing metabolites by highly active cellular lysophospholipase activities . We examined if the elevation in radioactivity incorporated into LPC in C. trachomatis-infected cells was associated with an increase in radioactivity in the aqueous fraction. The aqueous fraction was isolated and radioactivity in this fraction determined. Radioactivity incorporated into the aqueous fraction was elevated 16.5-fold (p < 0.05) in C. trachomatis-infected cells compared with mock-infected cells (Fig. 1D). The majority of this radioactivity (>90%) was associated with glycerophosphorylcholine. The pool size of LPC was examined in these cells. LPC represented 3.7% of the total phospholipid mass of these cells and was unaltered in C. trachomatis-infected cells. These data indicated a rapid catabolism of the newly formed LPC in C. trachomatis-infected cells. The formation of LPC by PLA2 hydrolysis is considered to be the rate-limiting step of PC catabolism in cells . In addition, we recently demonstrated that phosphorylation of calcium-dependent cytosolic PLA2 (cPLA2) was elevated following C. trachomatis-infection of Hela cells which implied an increase in PLA2 enzymatic activity subsequent to infection . We examined the reason for the elevation in LPC and aqueous choline-containing metabolites formation from LDL-derived PC in C. trachomatis-infected L929 cells. Twenty two h post infection, the cells were isolated and membrane fractions were prepared and PLA2 activity determined using 1-palmitoyl, 2-[9, 10-3H]palmitoyl-glycerophosphorylcholine as substrate. Infection of cells with C. trachomatis resulted in a 51% increase (p < 0.05) in calcium-dependent PLA2 activity compared to mock-infected cells (Fig. 2). Since cPLA2 has a preference for arachidonyl-containing PC, calcium-dependent PLA2 activity was determined using 1-stearoyl, 2-[1-14C]arachidonoyl-glycerophosphorylcholine as substrate. PLA2 activity was 1.2 pmol/min/mg protein (mean of two dishes) in mock-infected cells and elevated 33% to 1.6 pmol/min/mg protein (mean of two dishes) in C. trachomatis-infected cells. Thus, infection of L929 cells with C. trachomatis caused an elevation in calcium-dependent PLA2 enzyme activity which would explain the increase in hydrolysis of LDL-derived PC. PLA 2 activity in C. trachomatis -infected cells. L929 cells were infected with C. trachomatis at a multiplicity of infection of 3 to 5 CFU. 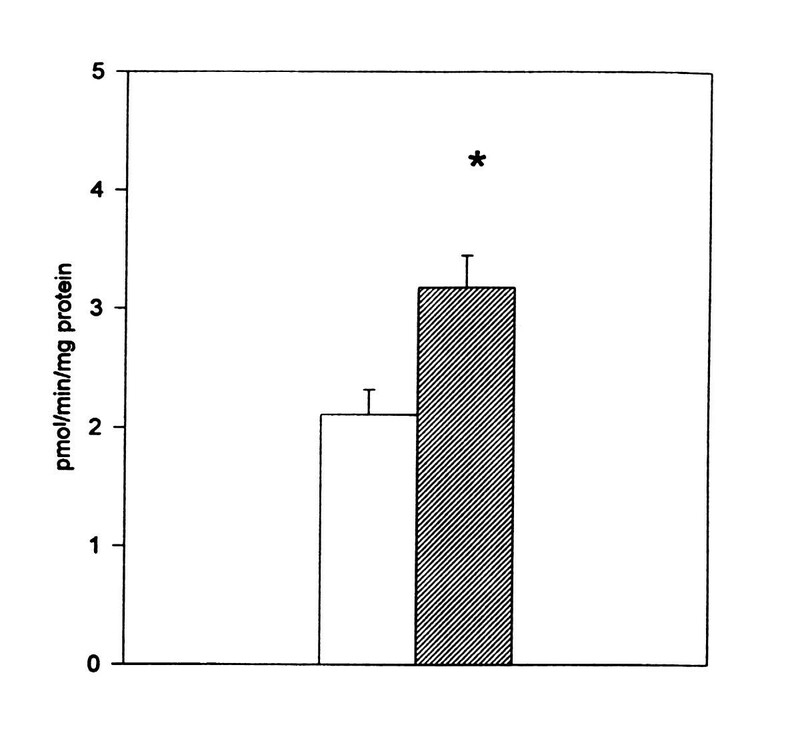 At 22 h post infection (hatched bars) or post mock-infection (open bars), cells were isolated and membrane fractions prepared and calcium-stimulated PLA2 activity determined as described in Materials and Methods. Results represent the mean ± standard deviation of three dishes. *p < 0.05. Hepatocytes synthesize and secret very low density lipoprotein and nascent high density lipoprotein and the principle phospholipid found in secreted lipoproteins is PC . To examine if PC secretion into the medium was altered by C. trachomatis-infection, isolated rat liver hepatocytes were infected with C. trachomatis at a multiplicity of infection of 5 to 20 CFU (infection-forming units per cell). Mock-infected cells were treated in an identical fashion to infected cells except that the organism was absent. At 20 h post infection or post mock-infection, cells were incubated for 16 h with [methyl-3H]choline and radioactivity incorporated into cellular and medium PC and LPC determined. Cells were viable as greater than 98% of infected or mock-infection hepatocytes excluded Trypan blue. Radioactivity incorporated into cellular PC was increased with increasing amount of CFU indicating an increase in PC biosynthesis (Fig. 3A). In addition, radioactivity observed in cellular LPC was elevated with increasing amount of CFU indicating an increase in catabolism of newly synthesized PC (Fig. 3B). In contrast, radioactivity observed in medium PC was unaltered with increasing amount of CFU indicating that PC secretion into the medium was unaltered by C. trachomatis-infection (Fig. 3C). In contrast, LPC in the medium was elevated with increasing amount of CFU. This is consistent with the ability of serum or albumin in the medium to rapidly extract LPC from hepatocytes . Cellular PC and LPC synthesis and their release into medium of hepatocytes infected with C. trachomatis. Isolated rat liver hepatocytes were infected with C. trachomatis at a multiplicity of infection of 5 to 20 CFU. At 20 h post infection or post mock-infection, cells were incubated for 16 h with [methyl-3H]choline and radioactivity incorporated into A. cellular PC, B. cellular LPC and C. medium PC (circles) and LPC (squares) determined. Results represent the mean of three dishes from two separate sets of hepatocytes. The results clearly indicate that metabolism of PC derived from LDL is accelerated during C. trachomatis-infection and support the notion that LDL-delivered PC may serve as a potential source of PC trafficked to Chlamydia. In addition, C. trachomatis-infection does not affect PC secretion from hepatocytes into the medium and support the notion that the pool of de novo synthesized PC utilized for hepatocyte lipoprotein secretion into the medium differs from the pool that is used for trafficking to C. trachomatis. Phosphatidyl [methyl-3H]choline, [methyl-3H]choline chloride, 1-palmitoyl, 2-[9,10-3H]palmitoyl-glycerophosphorylcholine were obtained from New England Nuclear, Dupont Canada Inc., Mississauga, Ontario, Canada. 1-Stearoyl, 2-[1-14C]arachidonoyl-glycerophosphorylcholine was obtained from Amersham Biosciences Baie d'Urfe, Quebec, Canada. Phospholipid standards were obtained from Sigma Chemical Co. St. Louis MO. Universol scintillation fluor was obtained from ICN Biochemicals Inc. C. trachomatis L2/434/Bu was used throughout this study and was grown in monolayers as previously described [4, 5]. One microgram of cycloheximide was present in the postinfection growth medium of mouse L929 cells. Mouse L929 cells were cultured in minimal essential medium containing 10% bovine calf serum at 37°C. Cells were infected with C. trachomatis at a multiplicity of infection of 3 to 5 CFU. Mock-infected host cell cultures were treated identically except that C. trachomatis was not added. Rat liver hepatocytes were isolated by collagenase perfusion and cultured in Dulbecco's minimal essential medium containing 10% bovine calf serum at 37°C . 24 h post isolation hepatocytes were infected with C. trachomatis at a multiplicity of infection of 5 to 20 CFU for 16 h. Mock-infected hepatocytes were treated identically except that C. trachomatis was not added. Phosphatidyl [methyl-3H]choline labelled LDL was prepared as described . L929 cells were washed with warm PBS, infected with C. trachomatis, and then incubated overnight in 5% delipidated serum (containing cycloheximide). Twenty h post infection cells were incubated for 5 h with 2–3 ml medium containing 10–50 microgram LDL/dish (0.04 microCi/dish) added as 10–20 microliter from a 10 mg protein/ml stock solution in medium pH to 7.0 with NaOH. The incubation was terminated by washing the cells twice with 3 ml of ice cold PBS containing 2 mg/ml BSA. Two ml of methanol:water (1:1, by vol) were added and the cells harvested. 25 microgram of this suspension was taken for the determination of protein and 25 microgram taken for the determination of total radioactivity associated with the cells. Phospholipids were isolated, separated and radioactivity incorporation determined as described . The phospholipids extraction recoveries were >90%. The aqueous phase was dried under air, resuspended in 1 ml of water and a 0.1 ml aliquot taken for the determination of radioactivity in the aqueous choline-containing metabolite fraction. Another 0.1 ml aliquot of the aqueous phase was spotted onto a thin layer chromatography plate and glycerophosphorylcholine separated in a solvent system containing methanol:0.6% NaCl:NH4OH (50:50:5, by vol). The aqueous metabolite extraction recoveries were >85%. In other experiments, 20 h post infection hepatocytes were incubated for 16 h with 2–3 ml medium containing 28 micromolar [methyl-3H]choline (2 microCi/dish). Radioactivity incorporated into phospholipids was determined as described . In some experiments, 22 h post infection L929 cells were homogenized in 10 mM Tris-HCL, pH 7.4, 0.25 M sucrose, 1 mM EDTA using a tight fitting Dounce A homogenizer and membrane calcium-stimulated PLA2 activity was determined as described  except that 1-palmitoyl, 2-[9,10-3H]palmitoyl-glycerophosphorylcholine or 1-stearoyl, 2-[1-14C]arachidonoyl-glycerophosphorylcholine were used as substrates. The formation of products in the assay was linear for up to at least 60 min. LPC pool size was determined by measurement of phospholipid phosphorus content as described . Trypan blue exclusion was used to test cell viability. Student's t-test was used for the determination of statistical significance. The level of significance was defined as p < 0.05. Both authors contributed equally to the design and experimental of the study, wrote and edited the manuscript. Supported by grants from the Canadian Institutes of Health Research to G.M.H. and G.M.